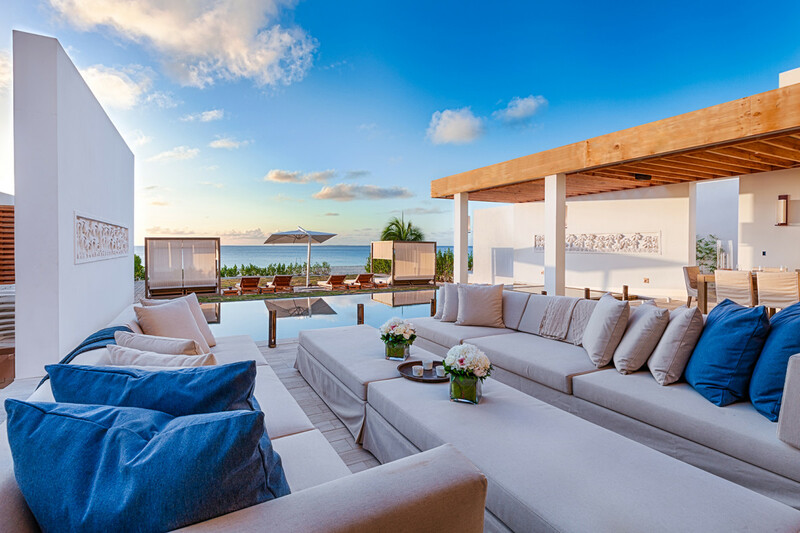 Experience modern indoor/outdoor living in these sparkling new villas situated side-by-side on the pristine white sands of Anguilla’s Meads Bay. Floor to ceiling windows immerse guests in this breathtaking, world class location. Walk to top restaurants, charming beach cafes and enjoy a cocktail along a fabulous mile-long stretch of beach anchored by 5-star resorts on each end. Lounge on outdoor canopy beds, cool off in the private infinity pool or relax in a beachside hot tub. Kishti Villas on Meads Bay offer the pinnacle of luxury and pampering in the heart of one of Anguilla’s most gorgeous beaches. Six bedrooms in calming blues and neutrals echo the surrounding tropical beauty. Book both villas — Kishti East and West — for a combined 12 bedrooms accommodating up to 24 guests. Each villa has rooftop and patio gardens, guest and chef kitchens, home theater and gym. The exceptional private staff will attend to each detail and request, perfecting this memorable and serene vacation experience on Anguilla. Kishti East is immediately available, and Kishti West is slated for completion November of 2015. Copyright © 2013-2019 www.luxvacation.com. All rights reserved.